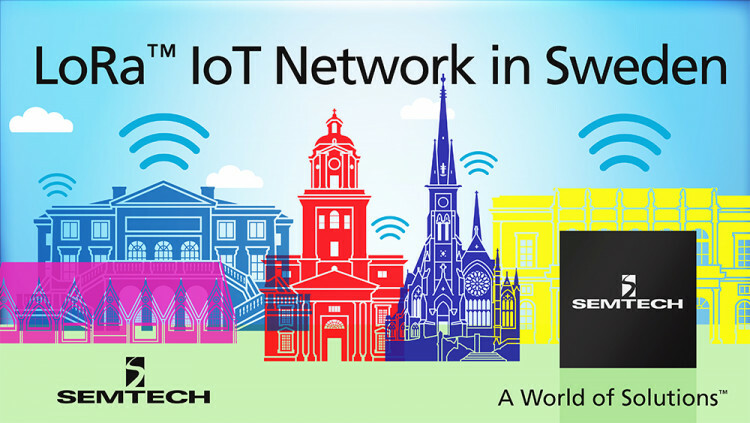 Semtech Corporation (Nasdaq: SMTC), a leading supplier of analog and mixed-signal semiconductors, today announced that its LoRa® Wireless RF Technology will be featured in a new IoT network that will be deployed in Gothenburg, Sweden by telecom operator Tele2, and IoT and telecom network specialist TalkPool AB, an affiliated company of TalkPool AG. The Tele2 network, based on the LoRa Alliance open LoRaWAN™ specification, will include the building blocks necessary for customers and partners to test, use and develop their own IoT solutions quickly, including sensors and base stations embedded with Semtech LoRa wireless chipsets, as well as the applications for managing the sensors, processing the data, and managing the connectivity of each device connected to the network. Initial applications targeted for the network include smart city, public transportation, smart metering, environmental monitoring, pest control and asset tracking. The Tele2 network is expected to go live in the third quarter of 2016. For technical support or general product inquiries, check out the LoRa Community or contact Semtech’s support team. All statements contained herein that are not statements of historical fact, including statements that use the words “will,””planned,” “targeted for,” “offered,” or other similar words or expressions, that describe Semtech Corporation’s or its management’s future plans, objectives or goals are “forward-looking statements” and are made pursuant to the Safe-Harbor provisions of the Private Securities Litigation Reform Act of 1995, as amended. Such forward-looking statements involve known and unknown risks, uncertainties and other factors that could cause the actual results of Semtech Corporation to be materially different from the historical results and/or from any future results or outcomes expressed or implied by such forward-looking statements. Such factors are further addressed in Semtech Corporation’s annual and quarterly reports, and in other documents or reports, filed with the Securities and Exchange Commission (www.sec.gov) including, without limitation, information under the captions “Management's Discussion and Analysis of Financial Condition and Results of Operations” and “Risk Factors”. Semtech Corporation assumes no obligation to update any forward-looking statements in order to reflect events or circumstances that may arise after the date of this release, except as required by law.